Did you know that all orders over $250 ship free? We just found out all of our friends & customers don’t know that, so before we went one step further, we wanted to remind everyone that orders over $250 ship free! And now, onto summer styles! The kids are out of school – or will be in a few days! – so it must *officially* be summer. 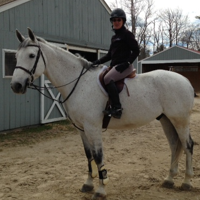 Frankly, I don’t consider it to be truly summer until I get dumped in a creek on a trail ride – and don’t mind it a bit! – but that’s probably not the standard we should be using to define the seasons. Turquoise is so on trend this summer. The organic look and one-of-a-kind blue evokes Caribbean seas, restful and tranquil. 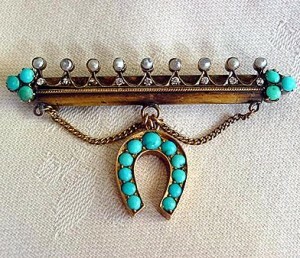 If you love vintage horse jewelry, you’re going to love this turquoise horseshoe pin: it’s from the 19th century! 11 lovely turquoise stones adorn the horseshoe – always lucky! – which dangles from an antique gold pin bar. On the end of the bar, there are three clustered turquoise stones. A chain detail connects the bar to the horseshoe. Classic styling that works so well with today’s fashions. And now we’re going to take a trip down memory lane. Once upon a time, summer meant a trip to Atlantic City – the most exciting destination you could ever imagine, with sideshows and attractions designed to wow the tourists around every bend. One of these attractions was the diving horse show. Several times a day, a lovely lady in a sparkly costume would, with her horse, plummet from the top of a sixty foot tower into a pool of water below. I wish you could have seen it – maybe you did? For a moment, staring up from the boardwalk, it seemed utterly impossible that a horse would ever willingly go off of that safe perch to plunge into a pool so far below. Sixty feet is pretty darn high – as a child I remember thinking that it was even taller than our house – but after a moment, there would be a little fan fare and whoosh! Mane flying, tail flying, that horse leapt out on faith and splashed safely in the pool below. It was an amazing display of fearlessness. 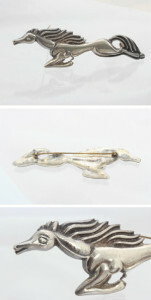 This 1920 Sterling Silver pin captures the look perfectly! Don’t miss this one of a kind piece: it’s perfect for this summer!